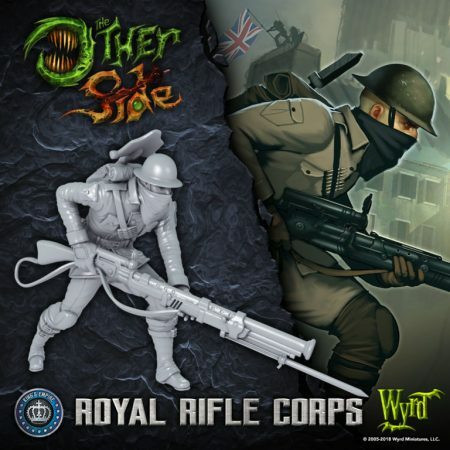 Wyrd Miniatures previews the Royal Rifle Corps for their 32mm Minis Game The Other Side. The Other Side is an upcoming game about allegiances doing battle across the Earth in a fight for supremacy and survival. Using 32mm miniatures, players will control squads of troops and massive titans as they attempt to defeat their foes and seize control of Earth.. 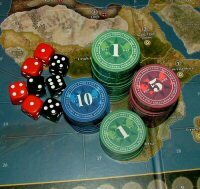 Conflict is resolved through the use of a deck of cards, allowing players more control over their own destinies. The Other Side shares a world with Malifaux, but the games are not compatible.